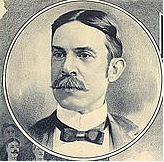 Lyman Howe was a prominent travelling showman with a fixed circuit of middle-class film exhibitions that promoted, in Charles Musser's apt phrase, 'high-class moving pictures'. Born in Wilks-Barre, Pennsylvania, Howe had only brief schooling when he went on the road in the early 1870s as a travelling salesman, later working for the Central Railroad of New Jersey after his father's early death. He went on the road again in 1883 exhibiting an intricate miniature working model of a coal mine, and between 1890 and 1896 travelled across Eastern Pennsylvania and then upstate New York giving phonograph concerts with an Edison machine. In 1896, he tried to acquire a Vitascope from Raff & Gammon, but the territory he wanted, and already knew from his phonograph tours, went instead to a Philadelphia group. He built his own motion picture projector, the Animotoscope, which premiered in his home town on 4 December 1896 using Edison films spliced togeter in a long programme. With this machine Howe added films to his concert presentations, featuring the phonograph and the Animotoscope through the end of 1899 lecture season. Usually travelling a quasi-Chautauqua circuit of church halls and small towns, Howe graduallly moved into opera houses and by 1903 he had established a number of centrally booked travelling companies and had himself withdrawn from personal exhibition. As Nickelodeons proliferated in small towns, Howe moved into larger cities, still emphasizing his 'high-class' programmes, with films of the Olympic games, the wedding of King Alphonse of Spain, or various travel programmes and newsworthy events, exhibited in opera houses or legitimate theatres and meeting halls specially rented for the occasion. His road companies developed a stable exhibition circuit for annual or semi-annual appearances across the East and Midwest; his activities are comparable to the lecture presentations of John L. Stoddard (1850-1910) and Burton Holmes, and represent an important alternative pattern of exhibition to either fixed theatres or fairground showmen. In addition to contracting for special films from a variety of European and American suppliers, Howe had been making his own films since 1901, at first local views, then news scenes, and finally travel films. His business lasted, something of an anachronism, until 1920, and after Howe's death continued as a commercial film laboratory and distributor of eductional short subjects.